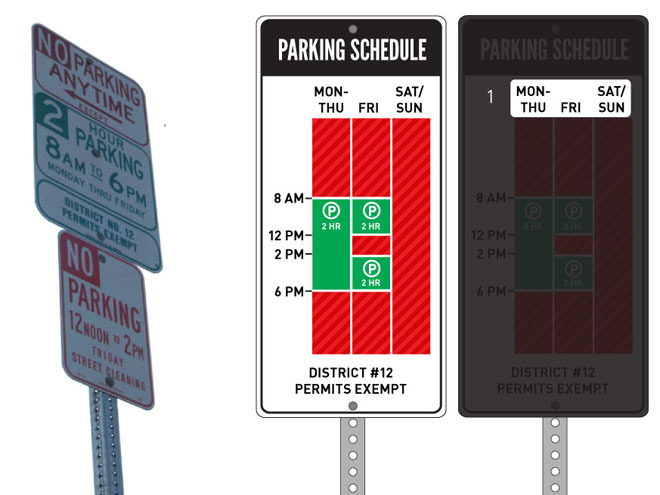 Article: A Redesigned Parking Sign So Simple That You’ll Never Get Towed | Design | WIRED. Not the first designer to “fix” parking regulations signs and probably not the last. This one really is simple. It’s the exceptions that cause issues, though, like if it’s a loading zone for a few hours in the morning. Do you add another color? A different pattern? An asterisk. It gets complicated in many places. But for the example above, the proposed solution is better.